Kelowna and the rest of the Okanagan attract a large number of people year round for short holidays, long stays and permanent moves. Kelowna boasts one of Canada’s highest average year round temperatures at 14.6 degrees. The winters are cold and cloudy but the summers are long, hot and dry. Kelowna also sees its fair share of rain with 15 inches falling annually; June being the wettest month of the year. While experiencing all four seasons can be a joy for the sights and senses, it’s not always the case for your property. And that’s where our Kelowna Pressure Washing service comes in. Over the course of a year, your home or business takes a beating from the weather; particularly during the winter months. Green algae, black discolouration and moss build-up over time; not just creating an unsightly mess but possible slipping hazards as well. Pressure washing is one of the most common applications for cleaning exterior surfaces because it is one of the most effective; which also makes it one of our busiest services. With this is mind, we make sure our Gorillas are fully trained in the process of our “completely clean” system. Using a combination of disinfectant/cleaning agent, soft brush scrubbing and our seamless wand system, our technicians will have every square inch of your property so spotless you could have a picnic on the concrete…without plates! We clean walkways, sidewalks, parking areas, entrances, or any other vertical or horizontal surface in need of some TLC. Each Gorilla technician is outfitted with a bucket truck with its own water supply. This allows us to specialize in cleaning anything, anywhere. 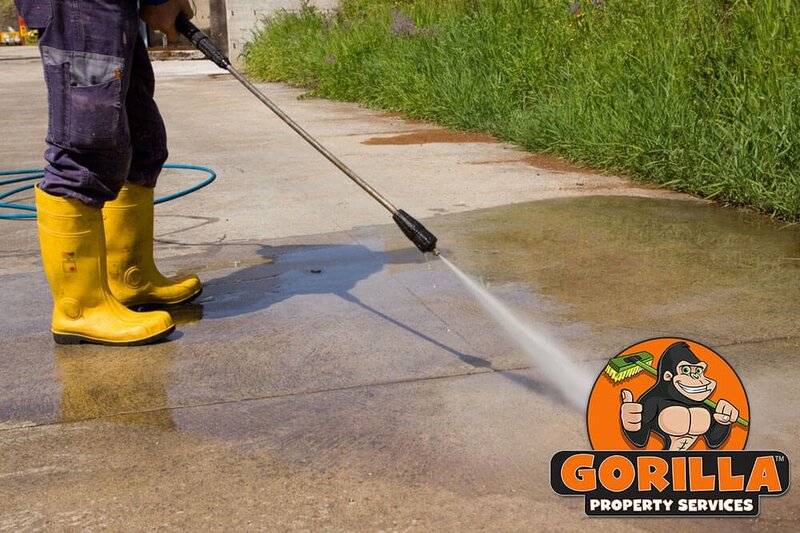 Statues, skate parks, tennis courts; no matter the surface or location, Gorilla Property Services have you covered. That’s why we’re the best in the business and the only call you need to make for all your Kelowna Pressure Washing needs.